At this point, it might be easier to figure out who doesn't have a Donald Trump Cheats at Golf story. Trump's cheating ways on the golf course have previously been documented—the Washington Post has a nice round up here if you'd like to read—but this latest example is so brazen it warrants mention. Oscar De La Hoya, who is promoting a fight between a Mexican fighter and a Muslim fighter, says he golfed with Donald Trump on Trump's own course two years ago and The Donald was shameless. 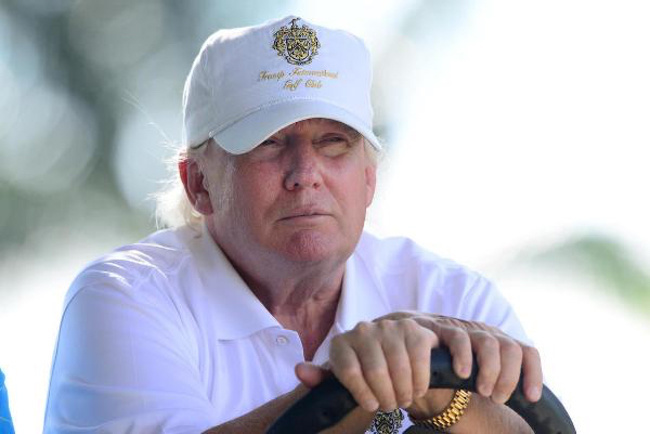 "Donald, what he does is he tees off first so we go off to our balls and what do we see but Donald Trump right in the middle of the fairway," De La Hoya said. "He said, 'Hey look, I found my first ball.'" On the next hole, a par-3, De La Hoya said Trump hit into some bushes and again went ahead of the other players in his cart. When the rest of the group got to the green, he said Trump's ball was 3 feet from the hole. "And by the way I'm picking it up," De La Hoya quoted Trump as saying. "It's a gimme." "Hey look, I found my first ball." I am not what you would call "a golfer," but I don't think that's how it works. He's been accused of similar shenanigans before, by former Sports Illustrated managing editor Mark Mulvoy. He told WaPo that while playing together sometime in the 1990s, Trump's ball mysteriously turned up on the green after rain briefly interrupted their round; it was not there before it started raining. When confronted at the time, Mulvoy said Trump's response was that the guys he regularly played with were cheaters, so he had to cheat in order to keep up. When Trump was recently confronted with this story, he denied it in typically boastful and dismissive fashion. He said of Mulvoy, "I don't even know who he is," and "I don't drop balls, I don't move balls. I don't need to." I'd say Trump won't be able to credibly deny knowing who Oscar De La Hoya is, but then again concerns about his own credibility haven't stopped him from doing anything yet. Donald Trump's Presidential Campaign Is Being Protected by Volunteer "Celebrity Boxers"